Available now on Xbox One, PS4 and PC. The hype around EA and Bioware’s latest creation has been pretty big but has it been worth the wait and lived up to expectations? Anthem while something new looks to be aiming it’s sights directly at Bungie’s Destiny. Destiny is a loot shooter with a plenty of end-game content but always seemed to lack that strong story telling that fans have been dying for, Anthem being developed by BioWare however should hopefully address this and be a recipe to please all fans. Taking the role of an unnamed FreeLancer, basically a human in a mech suit called a Javelin. You will be tasked with protecting the fortified settlement Fort Tarsis from deadly enemies which threaten the safe zone that many call home. The Dominion must be stopped and it will be your job as a FreeLancer to do this. As soon as the game loads and your suited up in your Javelin the views really are something special. The first few minutes of Anthem you can honestly sit back and admire the sheer amount of detail and work that has gone into the way this game looks, it’s honestly breathtaking at times! BioWare even managed to get the facial animations right this time around unlike the poor attempt in Mass Effect Andromeda, visually the game looks fantastic! Im a massive fan of Destiny and have to admit ploughing hours of my life into that game, somehow never getting bored of the grind that the game involves. The constant need to rank my characters power level up to the ever increasing level and acquiring some of the games rarer guns always keep me interested and coming back for more, can Anthem achieve the same thing though? Anthem is a strange one for me, while Destiny is a refined shooter and all about the loot and the guns Anthem is different, the guns in Anthem just seem to just be there, while getting an exotic weapon on Destiny really feels special and worth your time Anthem just isn’t like that. The guns really aren’t the main thing in Anthem it’s the Javelins, while on Destiny you have the choice between the Warlock, Hunter and Titan on Anthem you will need to decide what Javelin to go with. Each Javelin has it’s own special abilities, choosing the Colossus Javelin will grant you with a huge Javelin able to withstand more attacks than say the Storm which is much smaller and agile but can’t take as much damage. All the Javelins can fly though and flying is something that EA and BioWare have got right! The flying mechanic is done very well in Anthem! The controls feel sharp and accurate, especially fun when trying to guide your Javelin through tight canyons and tunnels. Unlimited flying isn’t something the Javelin can do however and you will constantly find yourself having to dive down to cool the Javelin or fly close to some of the lakes and water scattered around the beautiful world of Bastion to help stop your suit from overheating. If I am totally honest I think the flying in Anthem is probably one of it’s strongest features and if the whole game was remotely as good as the flying, the whole game would be fantastic! Aside from out in the open world of Bastion to explore there is also the safe zone called Fort Tarsis, sadly though the whole area is a bit of a waste. Fort Tarsis is filled with NPC’s but sadly they all offer no real filling to the game, no quests or anything can be had from them all they offer is pretty boring and unimaginative background stories which is a real shame as they could have been used for so much more! Visually the NPC’s look great and as I mentioned earlier the facial animations are really well done it’s just the fact they lack any real purpose to the game that is the shame. One character stands out from the rest and that’s Owen, he plays a pretty big role throughout which does help after speaking to some of the other dull characters. Out in the world of Bastion however there is plenty to explore and the game world really does look fantastic, especially being able to explore from above! Unlike In Fort Tarsis where you explore in first person view, out in Bastion your FreeLancer will be in third person view, combat in this view may suit some but I think some would have preferred it be first person given the choice. With all the special moves and abilities the onscreen action can be pretty intense with huge explosions, lightning bolts and ice just to name a few things that can be all happening on screen at once! Enemies are set out similar to the way Destiny has them with four different types, the Scars, Outlaws, Dominion and the Wildlife. All four types look very different and all have their own fighting style, unlike Destiny though which can be a challenge at times, the AI here is terrible! AI in Anthem is sometimes questionable if it has any at all, enemies will often just stay still until they have been taken out without even shooting or attacking back. The boss battles require a little more planning and strategy but the normal enemies are basically bullet sponges sadly. After the missions or maybe wandering through the games freeplay mode, your character will be rewarded with loot, sometimes plenty of it as well! The only problem I personally have with the loot is it really means nothing, guns and gadgets all look the same and really don’t make you want to collect them all or get excited about them as they would when you see the one off exotic drop in Destiny. The guns really are a massive let down, to make things worse you can’t even adjust the weapons on the fly during the game, the load out you leave the forge with will be the load out you are stuck with until you return Fort Tarsis to change them. The other thing that you can access In the forge is the section where you are able to customise your Javelin, changing colours, types of armour and even different emotes can all be done from here. The forge will offer the option to use what you have or buy new ones depending on if you have enough credits earned. Another huge problem this game has is the sheer amount of loading screens you will be looking at instead of actually playing, It is surprising just how much this game does actually load! Even on the Xbox One X you are guaranteed a fair amount of loading screens which can really detach you from the action. This video shows a bit of everything, the flying, combat, missions and the visuals. Last thing I wanted to talk about was the missions, I feel for most people it would be the most important thing and something I was really hoping being a BioWare game, they might actually get right. Sadly at this current moment in time they are boring and are all very similar, go somewhere, scan something, fight off waves on enemies and defend something, this or using your flying Javelin to reach orbs scattered around to activate something. All the missions just lack any real imagination or depth and that’s really disappointing coming from a developer like BioWare. It’s not all doom and gloom for Anthem, a few of the characters are likeable (mainly Owen) and the game world looks fantastic. The actual fighting and shooting can be fun but wears thin fairly quickly although the specials that the Javelins can do make you feel pretty god-like at times! The flying is probably the games biggest strength overall with the controls accurate and fun. 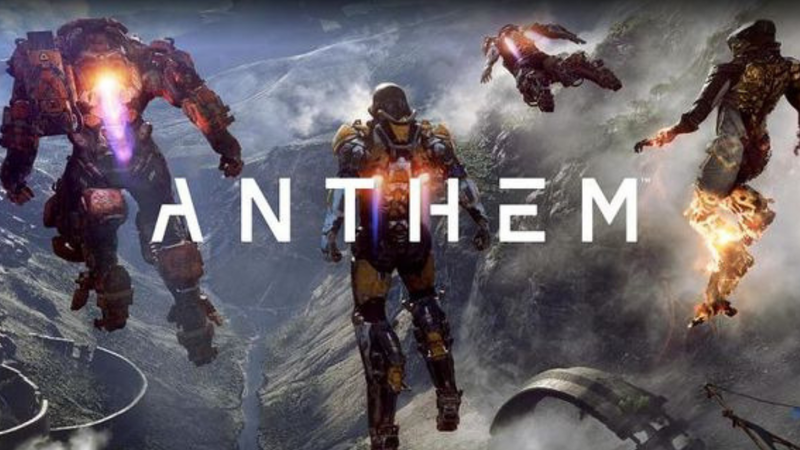 If Anthem had decent missions, shorter load times, better loot and just felt a little more finished it really could have been a great game but in Its current state it is difficult to recommend. All we can do is hope that with future updates and a bit of TLC this game can one compete with the likes of Destiny! This game code was sent to us free of charge for our honest review and has in no way influenced our rating of the game. Flying with your Javelin is fun and gives a slight feeling of what it might be like to be Ironman. Red Dead Online Beta Update Arrives Next Week!